Catnip (Nepeta): growing, planting, caring. Did you know? The effect of catnip on cast is related to their genes - 1/3 of cats ignore catnip, 1/3 appreciate it in moderation, and 1/3 go totally cray on it. Nepeta is a genus of flowering plants in the family Lamiaceae, with around 250 species native to Europe, Asia and Africa. Most are herbaceous perennials but some are annuals, with sturdy stems and opposite heart-shaped, green to gray-green leaves, tubular lavender, blue, white or pink flowers, spotted with tiny dots. Some species - the ones actually named catnip or catmint - contain nepetalactone, which binds to the olfactory receptors of cats, typically resulting in temporary euphoria. Catnips or Nepeta are a genus of dicotyledonous plants of the Lamiaceae family: there are about 250 species! With their blue ears and their magnificent bloom they replace the lavender north in cold climate. Some species are mainly known for the effects they have on felines. This reaction is also the origin of their names, they are called cat's herb. 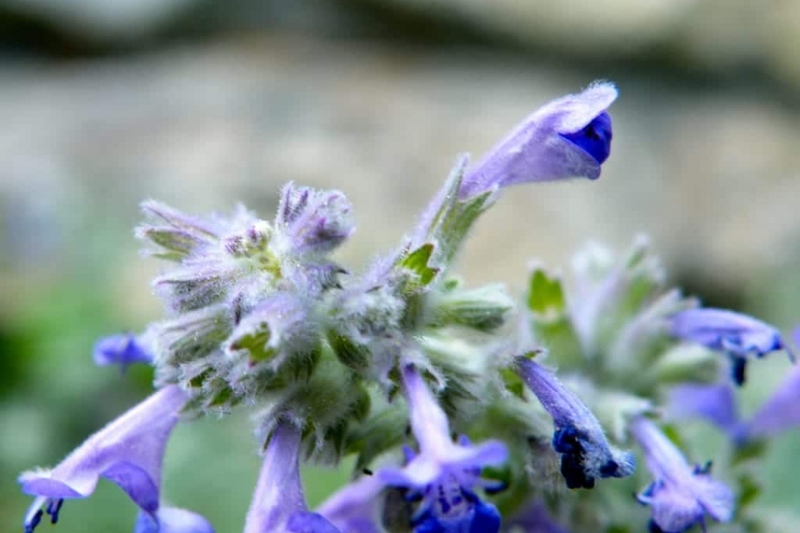 Nepeta is popular everywhere in countries with a mild climate, but it needs a good sunshine. Plant it in the fall, or possibly in the spring. Choose a sunny place, and a well-drained soil, even poor! Plant bushy species in beds, borders or hotpot; those with lining habit will form beautiful ground cover for embankments or rocks, but will also be very elegant in planter or in suspension. They match well with the rosebushes, because they hide rosebushes bald branches. Space the plants 40 to 60 cm depending their adult height - and lighten the soil with sand if necessary. Catnips do not suffer from drought, they appreciate dry and warm weather, it makes the color of the flowers more intense! Water during a few weeks after planting, and during hot weather or prolonged drought. For potted culture, water when the substrate is dry. After the first bloom, trim the tuft 20 cm above ground to incite flowering! Dry stems can be cut in late fall or can be left, protecting the stump during the winter in cool areas. In the latter case, you should remove the dry stems at the end of the winter. Harvest the leaves in the spring and summer, and as long as your catnips are healthy, rather in the morning for more aromas! Wait for your catnips to be big enough before picking the first leaves. You can keep the leaves dried for several months. Propagate by tuft division in March-April. Take out the whole tuft with a spade - clean and healthy - and cut it into several pieces. Replant the offsets from the periphery of the tuft.